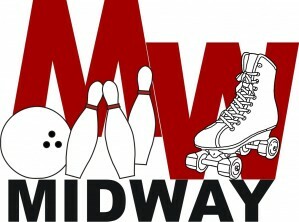 Midway Bowling and Skating Center is a unique family entertainment complex. Both are located on the same property and families can move between both centers to have an affordable day of fun. With plenty of food offerings, no one goes hungry during their family outing. Dinosaur ramps and bumpers are available at the Bowling Center so younger children can have tons of fun, too! The Bowling Center’s Sparetime Lounge offers parents a relaxing atmosphere where they can enjoy food and adult beverages while their children bowl and skate. There are affordable party packages for all ages that will make birthdays, anniversaries and reunions a BLAST! (We clean up the mess!) Businesses enjoy planning events around holidays or simply to reward employees for achieving budget goals or to create a team-building or morale boosting activity. You can find out about current events and specials on the website.